Verse: I John 4:8 - God is love. Such a lovely secret, Shhhhh! - Paint the Shepherd Follows the Star worksheet with brown watercolors. Outline with glue and purple glitter. 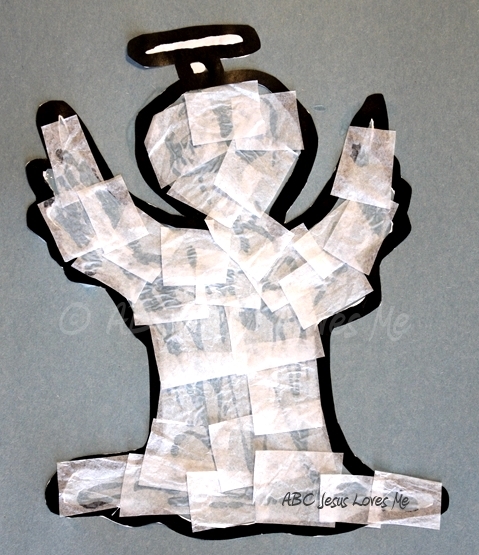 - Paint the Tissue Paper Angel worksheet with watered-down glue. Cover the angel with small pieces of tissue paper. Let dry and then cut out. Using craft scissors, cut the craft sticks to the size needed. Then glue them together with a hot glue gun and paint. 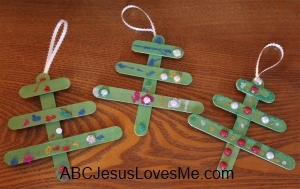 Decorate and glue a piece of string on the back of the ornament to hang. - Dress Up as a Shepherd: Using a brown paper grocery sack, cut a hole in the bottom for the child's head and two holes on the sides for the child's arms. Tie at the waist with a belt or rope. Add a towel around the head held on by a belt or rope. Add a staff made out of a wrapping paper roll. 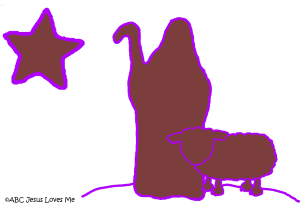 Hide a sheep or star and let the child try to find it. 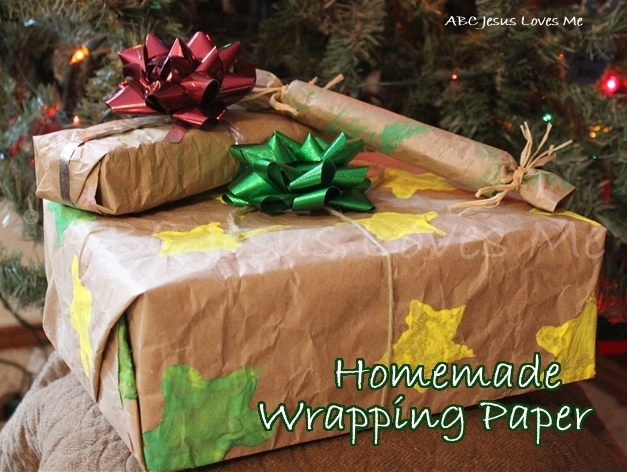 Make homemade wrapping paper with a brown paper grocery sack or large piece of brown packing paper. Paint, color, or stamp decorations using the color purple. Wrap up a present with the paper and add a purple bow. - Cut a sponge into a triangle shape. 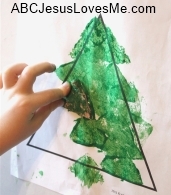 Dip the sponge into a shallow dish of paint and stamp onto the Triangle worksheet. Use a stamp to make the tree trunk. Teach the child to wash his hands before and after touching food, after playing with animals or outside, and after bathroom use. Demonstrate how to use the proper amount of soap to wash the back and front of hands as well as in between fingers and under fingernails. - Count and point to the fish as you read the book. - Using the Fish Bowl worksheet, create a fish bowl and cut out ten fish. Using sticky tack, place ten fish in the bowl. As you read the book, count and remove the fish. 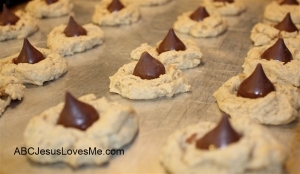 Make Kiss Cookies - a peanut butter cookie with a candy kiss on top. Allow your child to unwrap the kisses (great fine-motor activity) and put them on after baking the cookies. Use this time to practice washing hands. Give the cookies away and have the child tell the gift-receiver the Bible verse. Jump in various directions. Add obstacles for the child to jump on (bubble wrap) or over.